Yellow-billed Magpie. Photo credit Jerry Ting. Genetic diversity of Yellow-billed Magpies (Pica nutalli) before and after a West Nile virus epidemic. A. Vazquez, KD Gustafson, B. Harmeling, HB Ernest. 2018 in press. Journal of Wildlife Diseases. In 2018, Millie Vazquez and her collaborators analyzed the genetic diversity of Yellow-billed Magpies (Pica nutalli) before and after a West Nile virus epidemic. 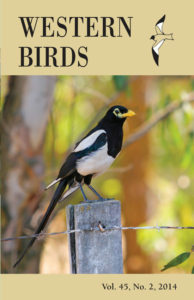 The authors found that arrival of WNV did not have a significant effect on the genetic diversity of the yellow-billed magpies, however they did discover a genetic bottleneck, likely caused by habitat loss, drought, and human disturbance. A genetic bottleneck is the result of a drastic loss of individuals in a population, which then causes lowering of genetic diversity. 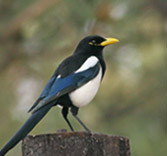 The researchers also found that yellow-billed magpies have low genetic diversity, on par with several endangered and protected corvid species. These findings, along with other work by our lab and other researchers, indicate that the Yellow-billed Magpie is at risk of further population declines. Habitat protection for these birds is vital. 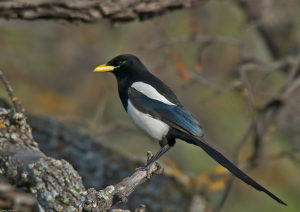 The Yellow-billed Magpie’s range is limited to the Central Valley and Central Coast Ranges of California. This California native bird suffered dramatic mortality from West Nile virus (WNV). During 2004-2007 thousands of dead magpies were reported to California Department of Health Services WNV Dead Bird Surveillance Program. During that time, of the >800 tested, on average approximately 80% tested positive for WNV, the highest WNV-positive percentage of all birds tested in California. Effects of West Nile virus and Pathology in Yellow-billed Magpies. Work of Holly Ernest, Leslie Woods, and Bruce Hoar. Have the magpies lost genetic diversity and become inbred? How are their populations structured? See DNA research of Holly Ernest and collaborators. ers of the Yellow-billed Magpie Working Group, the public through Magpie Monitor Program (2004-2010), California Department of Fish and Game, PRBO Conservation Science, The Audubon Society, and other agencies, organizations and ornithologists, we implemented studies to estimate their population size, loss of genetic diversity due to WNV, and viability over time. Genetic sequence data reveals widespread sharing of Leucocytozoon lineages in corvids. 2016. Freund D, SS Wheeler, AK. Townsend, WM Boyce, HB Ernest, C Cicero, RNM Sehgal. Parasitology Research. Crosbie SP, Koenig WD, Reisen WK, Kramer VL, Marcus L, Carney R, Pandolfino E, Bolen GM, Crosbie LR, Bell DA, Ernest HB. 2008. Early Impact of West Nile virus on the Yellow-billed Magpie (Pica nuttalli). The Auk- Journal of the American Ornithologists’ Union.125: 542–550. Ernest HB, Woods LW, Hoar BR. 2010. 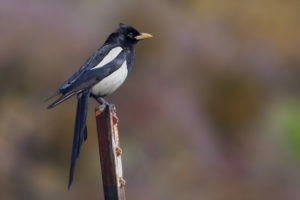 Pathology associated with West Nile Virus infections in the Yellow-billed Magpie (Pica nuttalli): a California endemic bird. Journal of Wildlife Diseases. 46:401-408. Annual Survival of House Finches in relation to West Nile Virus. Pelligrini AR, Wright S, Reisen WK, Treiterer B, Ernest HB. 2011. The Condor 113(1) 233–238. West Nile virus antibody surveillance in three Sierra Nevada raptors of conservation concern. Hull JM, Keane JJ, Tell LA, Ernest HB. 2010. The Condor. 112(1):168-172.